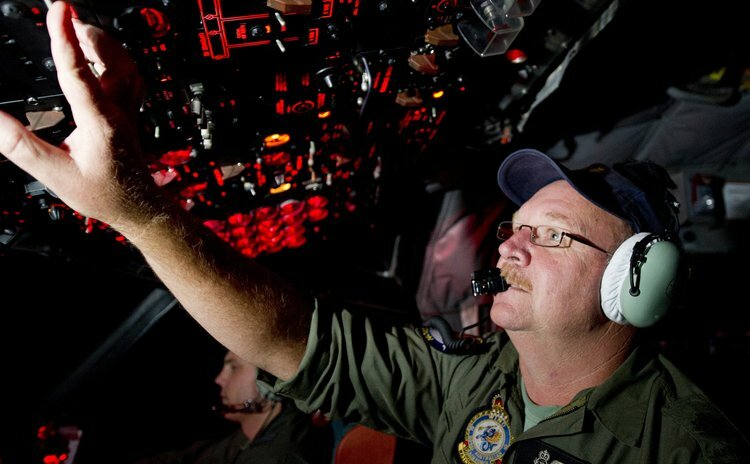 CANBERRA, March 24, 2014 (Xinhua) -- Royal Australian Air Force Officer Neil Scott-Jackson on board an AP-3C Orion after searching the southern Indian Ocean for Malaysia Airlines flight MH370. KUALA LUMPUR, March 24 (Xinhua/Sun) -- New analysis of satellite data suggested that the missing Malaysia Airlines Flight MH370 " ended" in the southern Indian Ocean, said Malaysian Prime Minister Najib Razak on Monday. He said he was briefed by representatives from the British Air Accidents Investigation Branch (AAIB), which informed him that Inmarsat, the British company that provided the satellite data which indicated the northern and southern corridors, had been performing further calculations on the data. They had been able to shed more light on the missing plane's flight path by using "a type of analysis never before used in an investigation of this sort," he said. "Based on their new analysis, Inmarsat and the AAIB have concluded that MH370 flew along the southern corridor, and that its last position was in the middle of the Indian Ocean, west of Perth," said Najib. The prime minister said as it was a remote location far from any possible landing sites, the missing plane ended in the southern Indian Ocean according to this new data. He said a press conference with further details would be held tomorrow. "We share this information out of a commitment to openness and respect for the families, two principles which have guided this investigation," he said. According to the prime minister, the families of the passengers and crew had been informed of this development by Malaysia Airlines. The airlines reportedly told relatives of the 239 people on board the missing plane on Monday that it believes the plane went down in the Indian Ocean with no survivors. With this heartbreaking news, he urged the media to respect the family members' privacy, and to allow them the space they needed at this difficult time.